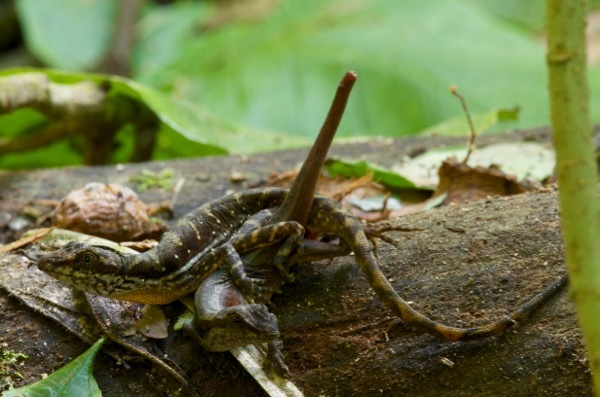 In 2013 and 2014 I went on herping trips with MT Amazon Expeditions to the Amazon basin in Peru. I skipped 2015 for some reason, but the call of the Amazon rainforest is strong (and loud, mostly frogs and crickets, with an occasional bamboo rat). So this year I signed up for another herptastic adventure. 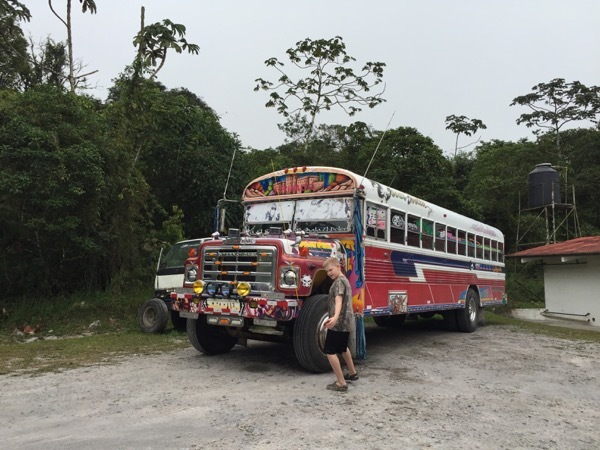 On the way to Iquitos, from which the Peru trip started, some of us took a little extra time for a Panama stopover. This was originally going to be convenient, since Copa airlines flew directly from Panama City to Iquitos. But at some point after we purchased our tickets Copa decided to cancel the Panama <-> Iquitos flights without warning, and getting our flights rearranged turned out to be a logistical nightmare. Fortunately for the rest of us, Matt Cage dealt with this nightmare on our behalf (behalfs? behalves?). Thanks again, Matt! Six of us participated in the pre-Peru Panama plan: Matt, myself, Joe, Kevin, and Kevin's kids Hayley and Ryan. 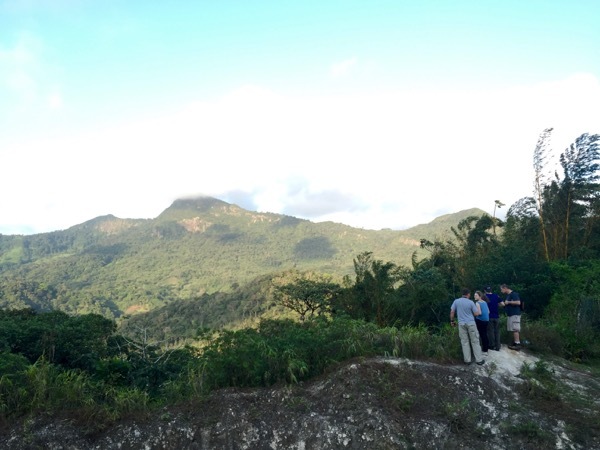 When the airline troubles were all straightened out we were left with two days in Panama. Early morning of Day One found us at the Panama airport, renting a minivan to drive to the town of El Valle de Anton. I had enjoyed a couple of days in El Valle in 2014 with Lorrie Smith, and was eager to return. 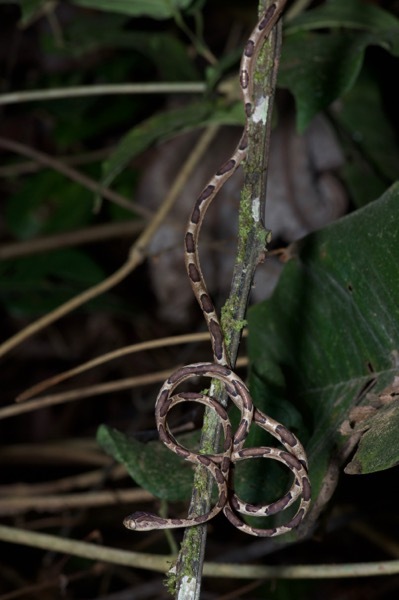 Driving in to El Valle we found our first herp: a squished Brown Vine Snake (Oxybelis aeneus) on the road. 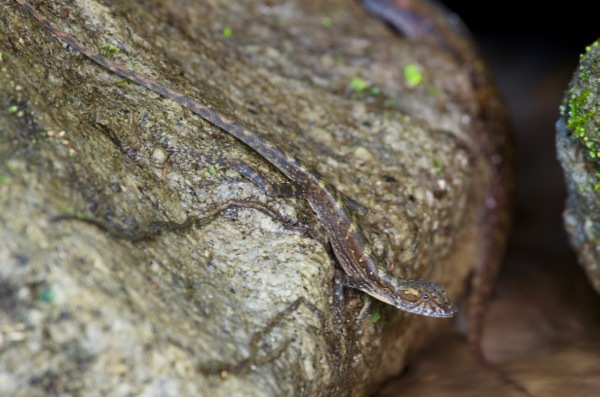 Our first non-squished herps were several Common Basilisks hanging around on rocks along a small stream. Soon we checked into our lodging for that first night, the Hotel Campestre. We had reserved two rooms via hotels.com but they had us down for only one room. We discussed this at some length with the friendly but non-English-speaking hotel receptionist, which was a bit challenging as none of us spoke any significant amount of Spanish. Eventually it was all straightened out and we got our two rooms. 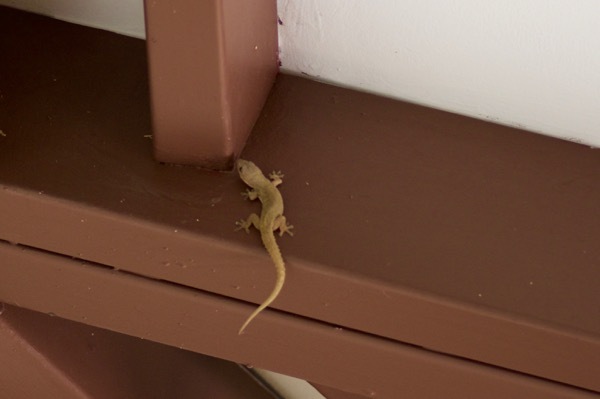 During the negotiations we admired a few geckos climbing around on the ceiling of the lobby. 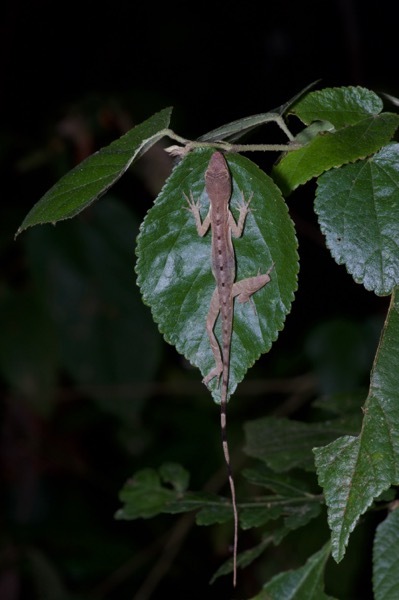 Tropical House Gecko (Hemidactylus frenatus), I think. We were supposed to meet Marrio, the owner of the local serpentarium, that evening so he could be our guide for some nocturnal herping. I had arranged this long in advance via email, and he had replied that he would be available and asked me to call him when we reached Panama. I had emailed again the previous night, but gotten no response. I then tried to call, but the phone number I had was bad. Matt and I and the friendly but non-English-speaking hotel receptionist worked on this puzzle for a while, digging up some more candidate phone numbers through which we also failed to reach Marrio. At some point in this process the hotel phone rang and was picked up by the friendly but non-English-speaking receptionist, who, after a brief phone conversation, somehow communicated to us that Marrio was at that moment on one of the trails behind the very hotel in the lobby of which we were trying to contact him. This seemed not particularly believable, but as it was our only lead Matt and I hiked a loop of that particular trail in search of Marrio. Unsurprisingly, we did not in fact find Marrio. We never found Marrio. He did respond to my email a few days later, when we were no longer in Panama, and apologized for being so hard to reach. While looking for Marrio we saw a couple of young Delicate Ameivas, which like all self-respecting ameivas did not stop moving for more than a few seconds. 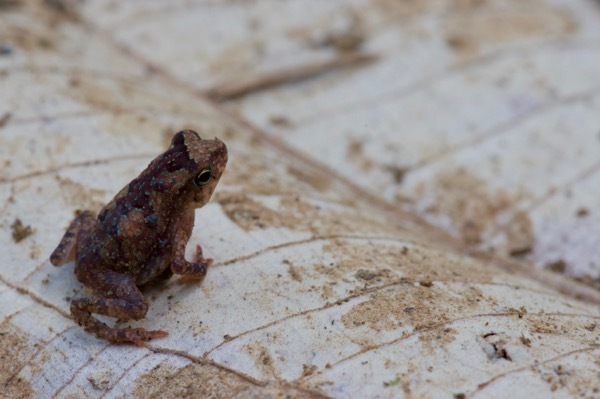 The rest of the gang had been herping on the hotel grounds and trails while Matt and I sought Marrio. 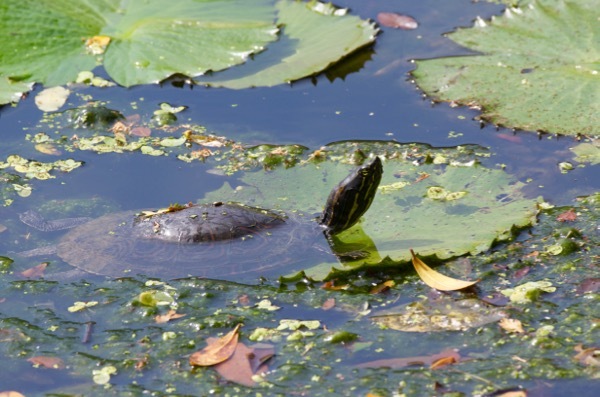 Joe had found a couple of turtles in a lily-pad-infused pond. We weren't sure whether they were native turtles or invasive Red-eared Sliders at the time, but examining the photos later leads me to believe that they were in fact the native sliders. Later that afternoon we all piled back into the minivan (now made sufficiently more comfortable by the absence of most of our luggage) and drove to a couple of potentially herpful sites I knew from my previous visit. 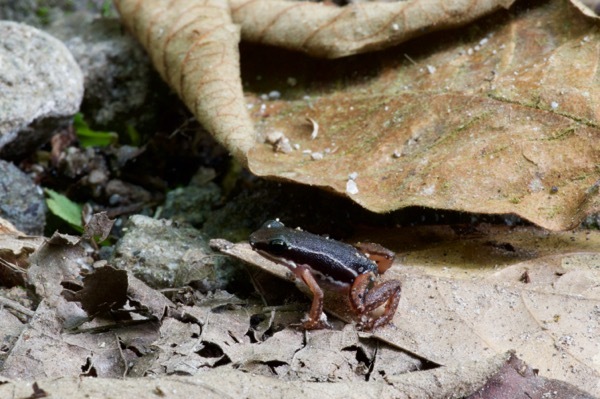 At a particular creek we hoped to find some small and not-especially-attractive dart frogs, and find them we did. 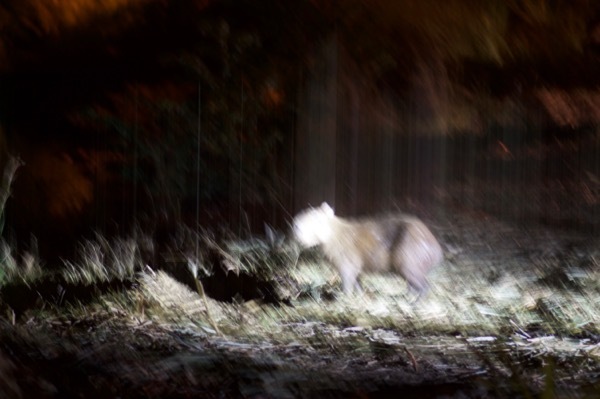 They were reasonably plentiful but quite jumpy; most of them disappeared with a few powerful leaps shortly after being sighted. Eventually we all managed to get at least a few photos. 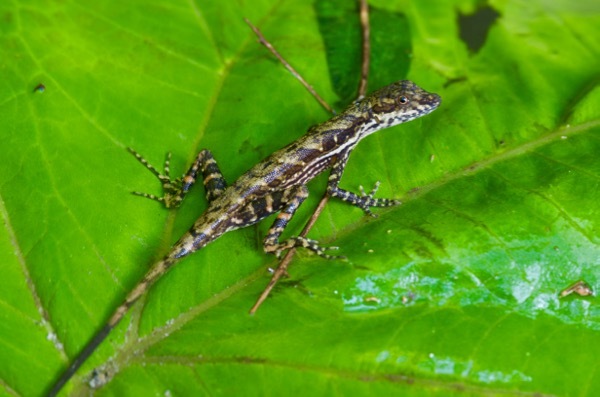 A goodly number of anole lizards inhabited the creekside vegetation and rocks. 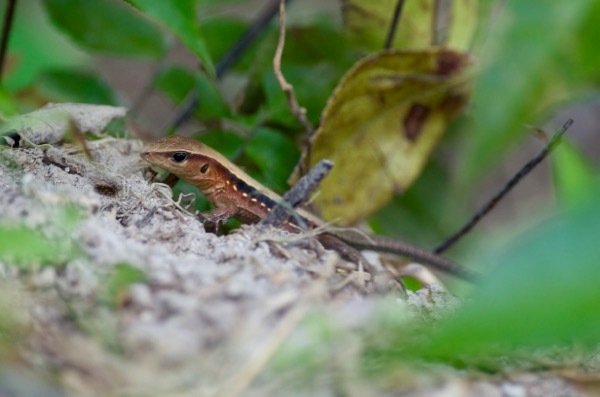 These were no ordinary ground-dwelling or arboreal anoles. These were extra-fun aquatic anoles, perfectly happy to leap into the water and swim to safety. "Hey, buddy, have you never heard of private time?" 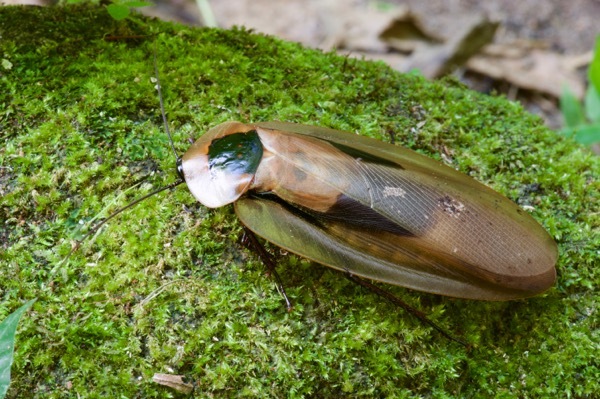 Ryan also found a particularly gigantic and really kinda pretty cockroach. At another site further up the mountain we found no herps but a lovely view. Without Marrio to take us out to places only he knew about, we decided we'd just stay around the Hotel Campestre and herp its grounds and trails that night. Once darkness fell, we spread out in various groups and started looking. 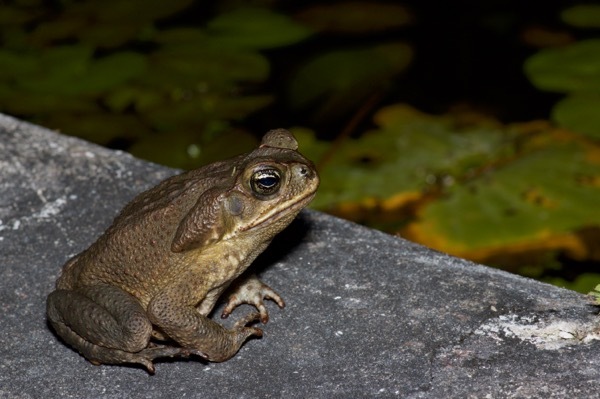 A shallow concrete pond and fountain out front of the hotel was patrolled by a legion of toads. Unfortunately, they were cane toads. 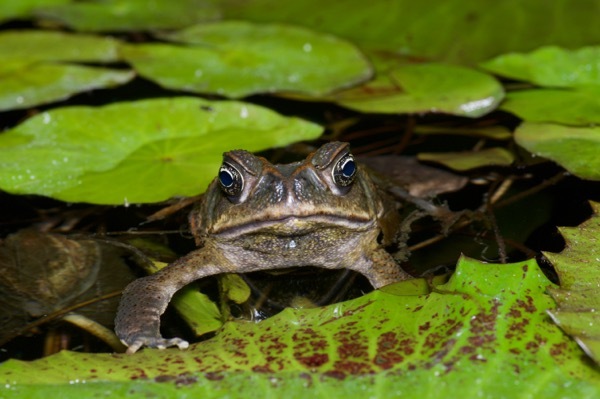 Fortunately, cane toads are a native species here, so we didn't have to think poorly of them. It's not their fault they were foolishly introduced to Australia, Hawaii, etc. Around the marshy spillover fringe of the fountain's pond a smaller set of toad-ish anurans made quite a racket. 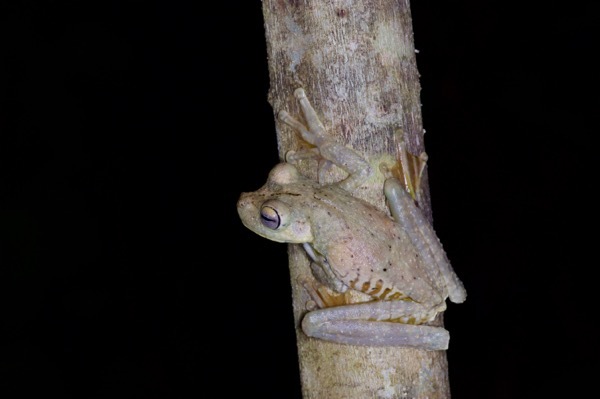 These frogs got significant press in recent years when it was discovered that their mating call also attracts hungry bats. 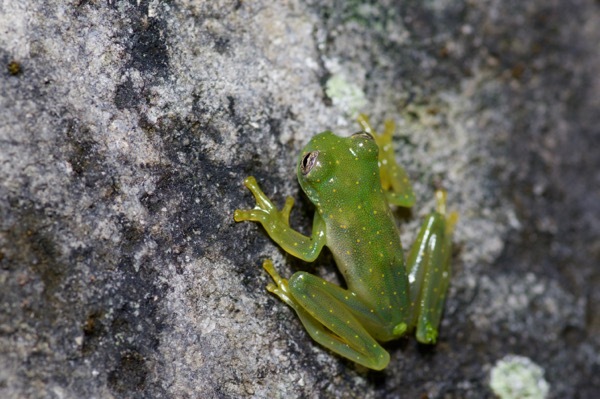 At another pond on the hotel's grounds we found a few of the local glass frogs. 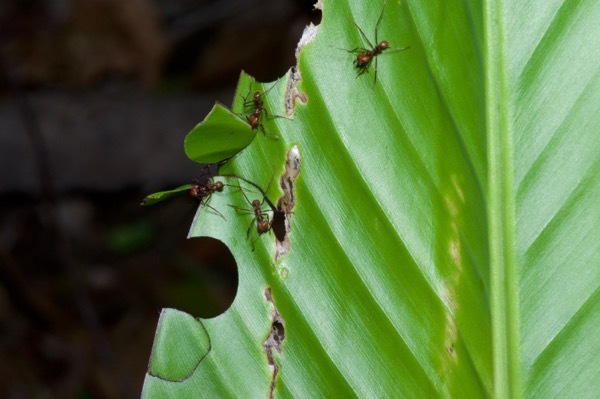 Nearby, ubiquitous neotropical insects lived up to their name. 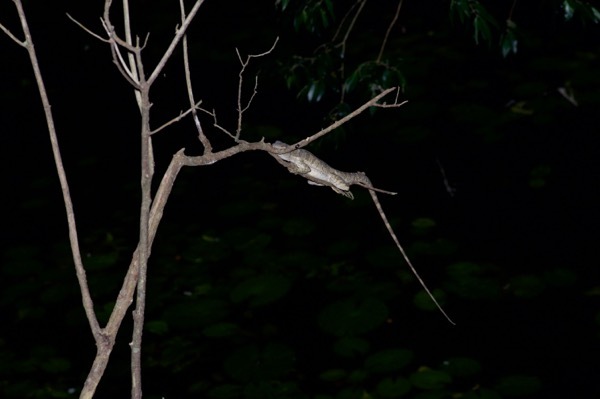 Perched on a thin branch high above a pond, an adult basilisk hoped it was safe from nocturnal predators. At one point Joe and I wandered over to the stream running through the hotel property. 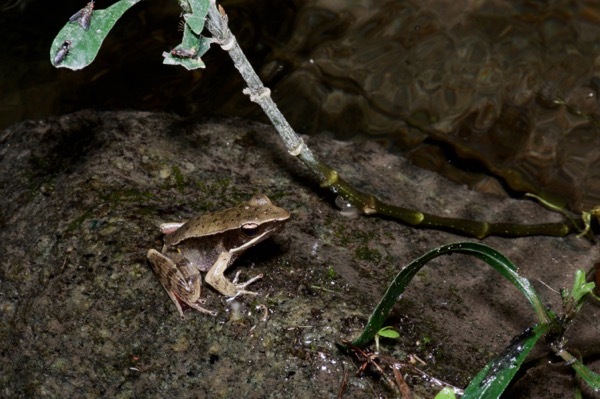 There we found Brilliant Forest Frogs, named not for their IQs but instead for the brightly colored flash marks on the concealed surfaces of their back legs. This one's IQ does not seem especially high given the quantity of tasty flies perched on the leaves just above it, which it has utterly failed to notice. 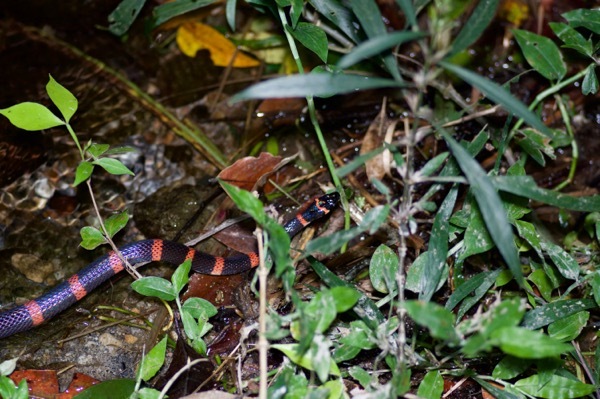 Soon thereafter Joe spotted the brightly banded colors of a snake creeping near the stream's edge. We thought it might be a coral snake, as there are many species of coral snake in the area and some of them sport this color pattern. It didn't really act like a coral snake, but since we weren't sure, and the snake wasn't going anywhere quickly, we thought it best to watch it for awhile and wait for the rest of the group to catch up. This did not happen quickly, even after I yelled "SNAAAAAKE!" back in their general direction a couple of times. What was wrong with these people? 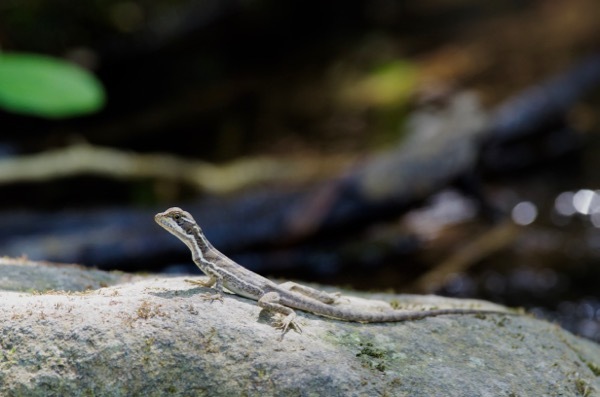 Eventually our companions joined us and we learned that their delay involved a couple of snakes of their own, plus some undesirable contact between some streamside rocks and Matt's knees, and between the stream itself and Matt's camera equipment. Their snakes turned out to be Central American Water Snakes (Hydromorphus concolor), one of which got away and one of which was captured for photos the next day (which I neglected to take). 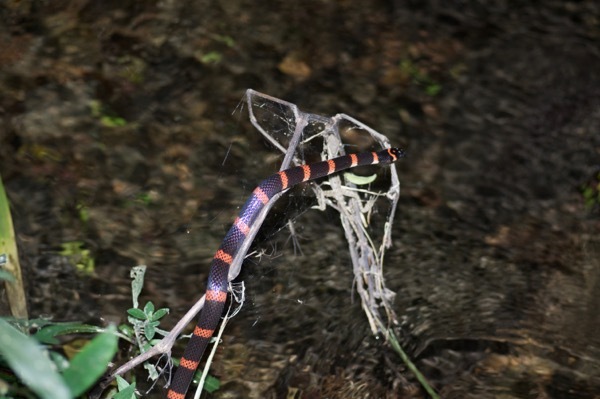 Our potential coral snake was recognized by Matt as a coral snake mimic, the Halloween Snake (Pliocercus euryzonus burghardti). We kept it for photos the next day also. 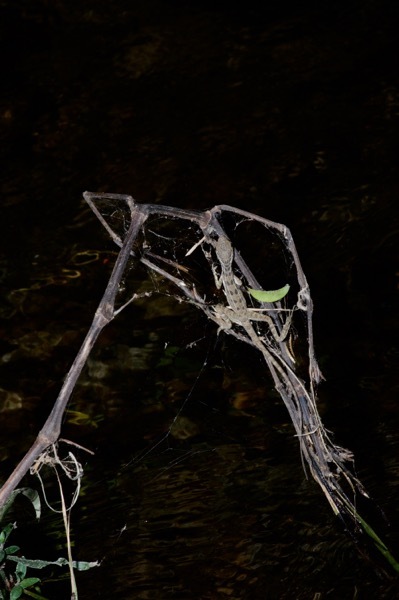 While we were discussing the identity of the colorful snake, I noticed a very small basilisk clinging to a few twigs overhanging the stream. Later I discovered that I actually had a photo of the Halloween Snake climbing right over that basilisk (second photo of snake above). Neither Joe nor I had noticed the lizard. Now whose IQ does not seem especially high? 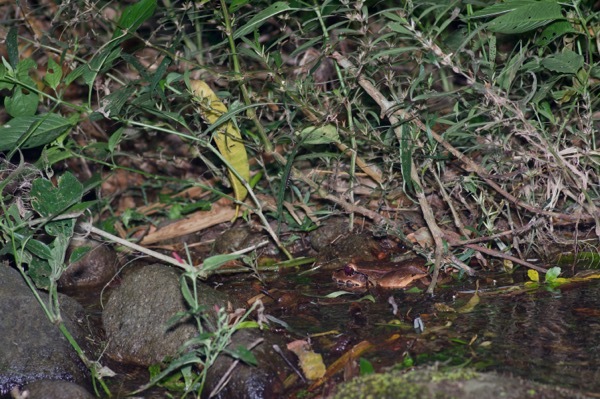 Later that night we caught the bright red eyeshine from a large frog on the other side of the creek. 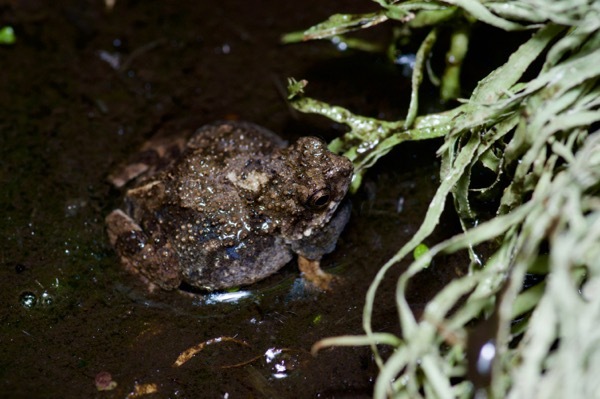 Hayley was the only one in our group wearing rubber boots, so naturally we sent her out to wade across the creek to try to catch the frog, knowing full well that these frogs are very difficult to catch due to their impressive strength, speed, and slipperiness. 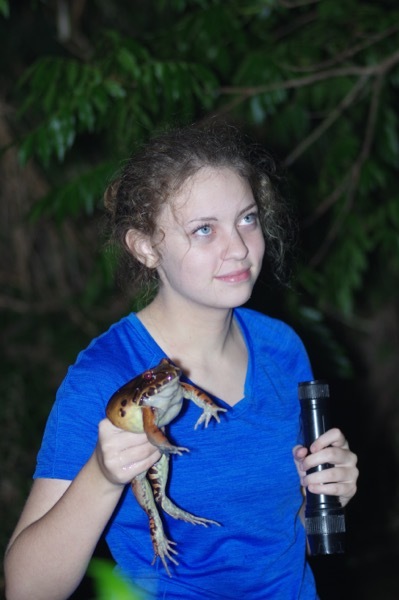 Hayley knew none of this, so she just crept up stealthily and grabbed the frog around the waist. Whereupon it screamed, like the one in this video but about ten times louder. Whereupon Hayley screamed, louder even than the frog. But she did not let go. The next morning Hayley, Joe, Matt, and Kevin posed our two captured snakes for photos before we released them back at the stream. 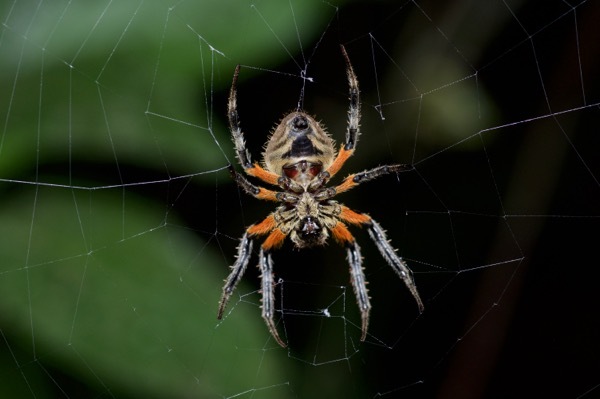 After driving around El Valle a little in the morning in the unsuccessful hopes of scaring up a diurnal snake or two, we headed back to Panama City and then on to Gamboa, a lowland rainforest area near the Panama Canal. We took an extremely brief tour of the Amphibian Research Center there, and then headed to Pipeline Road, world famous at least to birders. This road was cleared for an oil pipeline that never came to pass, and now runs along the border of Soberania National Park. You can drive along the first part of it, which we did, but then you must park and get out and hike, which we did also. ... and a few tiny toads. It had obviously recently been very dry in this normally-wet area, which could be the reason why we did not see many herps. There were some decent bugs around though. 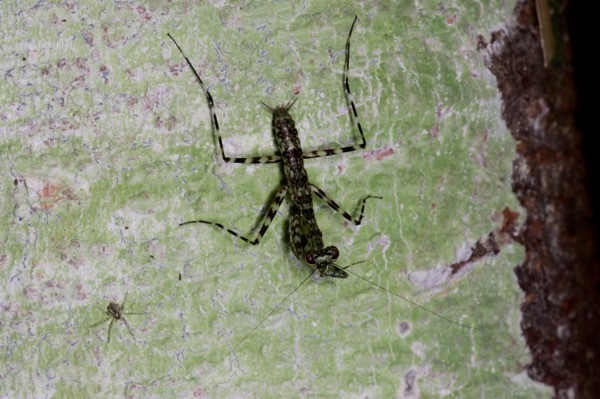 Bark Mantis (Liturgusa sp.). Also a photo-bombing tiny spider. 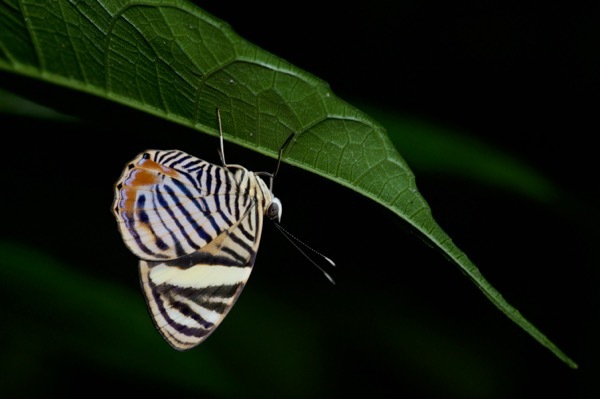 A purty butterfly. Juan Cruzado Cortéz on iNaturalist identified it for me as Tigridia acesta. The evening was not completely herp-free. 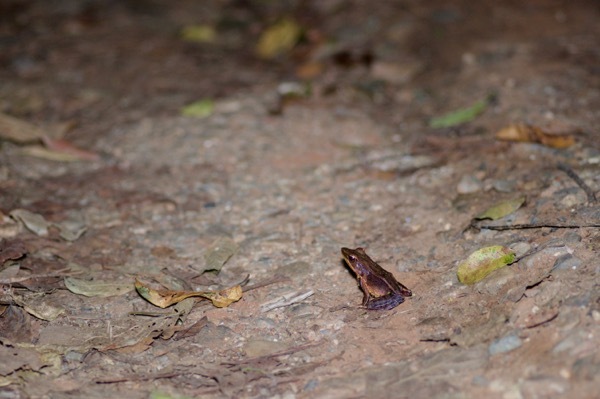 We did see a couple of forest-floor frogs. And a few sleeping anoles. 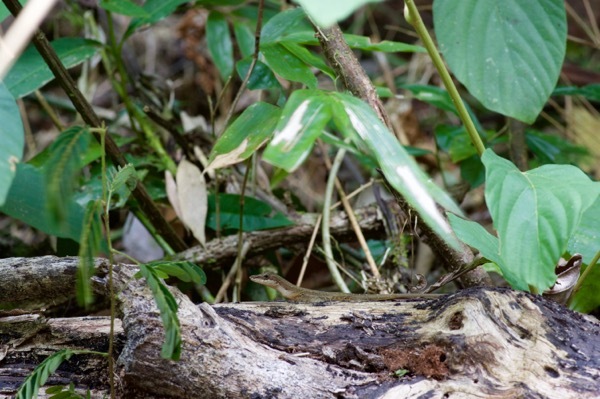 And one snake out looking for sleeping anoles on which to snack. 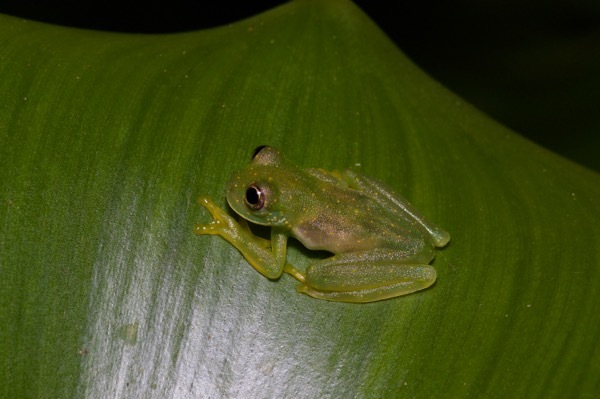 All in all we enjoyed our two days in Panama, though our herping results were unspectacular. The next day we hopped on a plane for Peru, where our fortunes were due to change considerably.